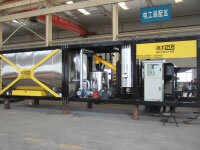 Adopting McDonald technology, the asphalt rubber blending plant is used to produce rubber asphalt. With this technology, the stone matrix asphalt is heated quickly to 218℃ in the heating device. Then the stone matrix asphalt enters into the continuous blending shearing device and mixes with room temperature rubber. Then the blended rubber asphalt is put into the reaction kettle with high temperature of 190℃~218℃. Then the rubber powder and asphalt will increase in volume and react for 45 minutes and be made into the modified binder. 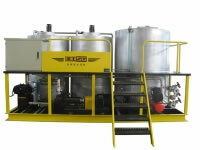 Batching System is composed of a hopper, beater and mixer. The batching system is used to convey the weighed rubber powder to a rubber powder device for high speed mixing. 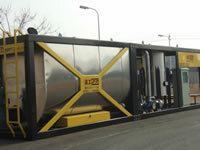 A heating device is equipped with a large area cross flow heat exchanger. 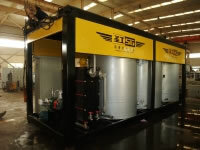 The heat is exchanged by the heat conduction oil. The temperature of the stone matrix asphalt is increased by 45-65℃ when the stone matrix asphalt flows through the heat exchanger by 10t/h. With highest rotation speed of 2900 rpm, the continuous blending shearing device is used to fully blend the rubber powder and asphalt. The continuous blending shearing device can scatter the cluster. By this means, the rubber particles can be evenly distributed into the binder. The strong mixing in the reaction kettle can prevent the separation of rubber asphalt. The reaction kettle is equipped with dual fuel heating system, including heat conduction oil coiled tubing heating and diesel burner fire tube heating.